Every year more than three billion trees are massacred by humanity. Torn from the landscape and converted into fuel, furniture, paper and cardboard. Some of them are just burned where they lie, victims of slash-and-burn agriculture. This is a disaster for all of us, but you can do something to help. These once mighty and beautiful living things aren’t just pleasing to the eye. They have more important jobs than providing a pleasing backdrop for your entertainment. Trees renew our air and clean up pollutants. They prevent soil erosion and even help to control the greenhouse effect by acting as carbon sinks. They have a key role in maintaining biodiversity, providing an environment for an army of animals and plants. So what happens to those three billion trees which are cut down every year? 46% of that three billion figure (1.38 billion trees) are used for fuel. 11% are used for lumber and a whopping 43% of those trees are processed into paper, cardboard and non-lumber products. That’s 1.29 billion trees cut down every year just to provide us with paper for catalogues, flyers, direct mail items and (not forgetting) good old toilet paper. So what can you do? 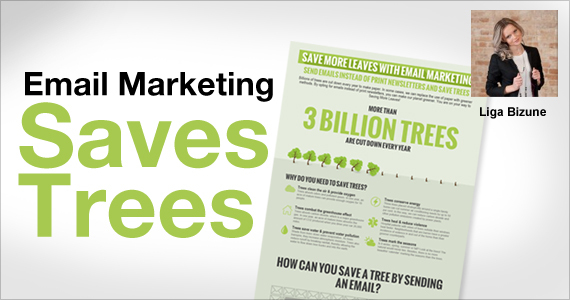 Well, one thing you can do that will have a direct effect on the demand for tree-based products is to change your marketing focus away from direct mail and embrace email marketing instead. Let’s look at an example of what such a change could mean. It takes 24 trees to create one ton of high quality paper suitable for use as letterheads, business cards, brochures and catalogues. That’s a bit difficult to picture in your mind’s eye, so let’s put that into a few different contexts for you. One ton of paper (24 trees that once were home to birds, squirrels and who knows how many insects and invertebrates) equals roughly 5000 square meters of 200-gsm paper. That is the equivalent of nearly 81,000 sheets of A4 paper. One ton of paper (24 trees again) equals roughly 3300 square meters of 300-gsm card stock. Or, in A4 terms, nearly 53,800 sheets. If one hundred businesses, who normally use 50,000 sheets of 200-gsm A4 paper per year for direct mail marketing, switched to email marketing we would see a savings of five million sheets of A4 paper. That’s 1482 trees that wouldn’t need to felled and processed. It might not be much when compared to the figure of three billion but it is a start. Click here to learn more. Takeaway: Email marketing is green marketing! 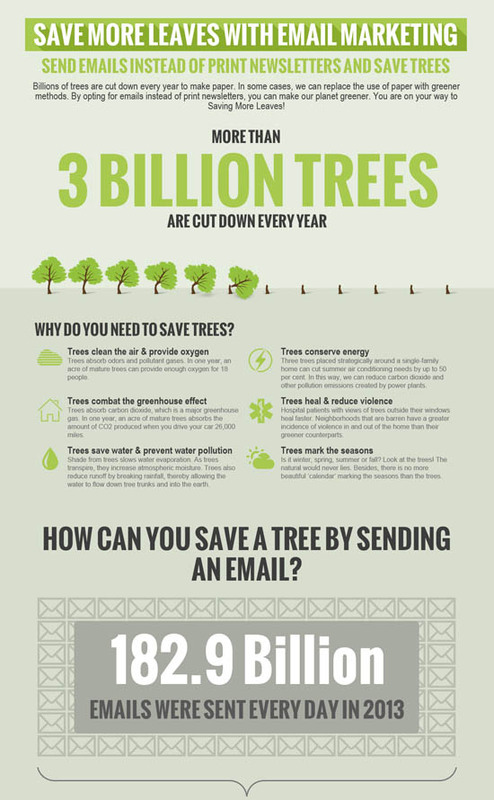 To embrace email marketing is to make an environmentally conscious choice.